Last Friday night, May 27, I attended “Emma Dunlavey CURVE Fine Art Photography Exhibit and VIP Shopping Event” at Leone, the posh fashion retailer in Vancouver. I went with my good friend Shelley, who was visiting Vancouver from London, Ontario. What can I say? Never have I clutched a glass of red wine and swanned in and out of racks bursting with gorgeous designer duds with such an edge of danger: Do Not Spill on Dior! Heh. Right, Shelley of blog Forest City Fashionista, and yours truly. Wearing our vintage duds and feeling like a million bucks. I chatted for a while with artist Emma, whose gallery of photographic works graced the venue and who donated for auction a copy of her latest coffee table book called RAW, autographed by her and co-author BC-native Pamela Anderson. Proceeds of the book and went to the charity Beauty Night Society which provides “life makeovers” to Vancouver women living in poverty in the Downtown Eastside; partial proceeds of artwork sales also went to the Beauty Night Society. Emma is what I call a jetset artist – she travels the world with her camera stopping for resin sculpting, shoots, and gallery openings here and there. Her poise and beauty (how does she keep her hair so perfect and her skin so dewy?!) made me ashamed to think I should have brought a sippy cup for my wine. Her website is here. 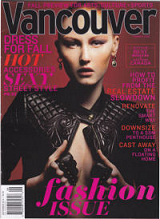 I met many of Vancouver’s glitterati that night, all dressed to kill. I particularly enjoyed hanging out in menswear where I chatted with photographer David Bong and his manager Yuliana Sirman, who is also a model. She is stunning! Click the link to see for yourself. Colleen Tsoukalas of the blog Clothes Line Finds. She is wearing a gorgeous dragonfly necklace by Carolyn Bruce Designs. The DJ was in fine form as well with very danceable sets, which she grooved along to in silver sequins. I’m sure her tunes juiced the crowd for the after party at Bauhaus, which I did not attend, being as vintage – or even vintage-ier – than my clothing. Vernard Goud, principal in LuvnGrace Entertainment which co-produced the event with Leone, wore a spectacular wild boar’s head slung around his neck, not a la Godfather, but a custom piece designed for him by Carolyn Bruce, who specializes in over-the-top steampunk jewellery. Everywhere I looked guests were adorned with her bling. (See Rich in the photo below.) You really must have a look at her wares here, utterly bold, daring, and original. Thank you, Vernard, for the invitation. Special thanks as well (I think?) to the two fantastic women at the Raw Foundation Culinary Arts & Nutrition Institute counter for saving (or ruining) my life by sharing their secrets to eating chocolate all day every day without regret and being able to make it by my bumbling self. Hahaha! Shelley with fashionisto Rich Zeuq MagtibayAbarquez, wearing a custom Carolyn Bruce adornment for his bowtie. Some of Carolyn’s other pieces are HERE. And that’s my report. Till next time! Shelley at Forest City Fashionista, a style blog which includes coverage of cultural events from London to New York and its fashionable +40 elite. Carolyn Bruce also has a fantastic photo gallery on Facebook.